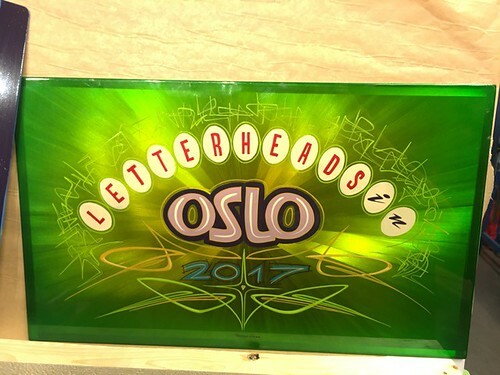 Last month the ‘Letterheads’ met for their annual meeting, which this year took place in Oslo, Norway, writes Helen Ingham. These informal gatherings originated in Denver, United States in 1975, as a chance for those involved in the sign painting trade to swap skills and socialise, without being tied to a rule book or formal membership. 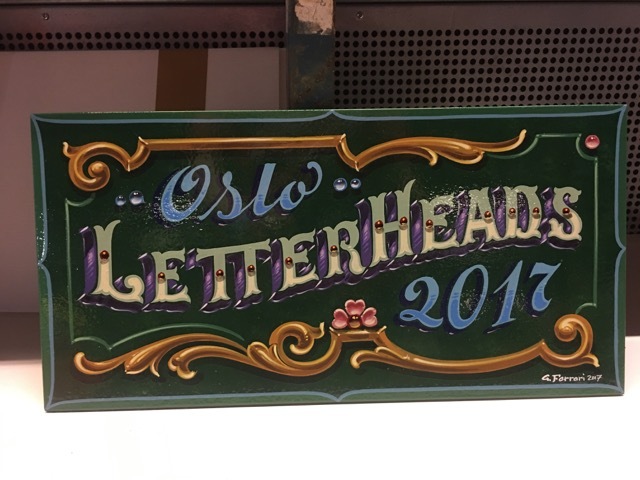 This year’s meeting was set up by Oslo signwriter and pinstriper Richie Chlaszczak with a host of international experts in attendance to offer advice and tuition. The weekend also offered the opportunity to socialise, which we certainly did – aided by at least four extra daylight hours (once the shock of the Norwegian bar prices abated). 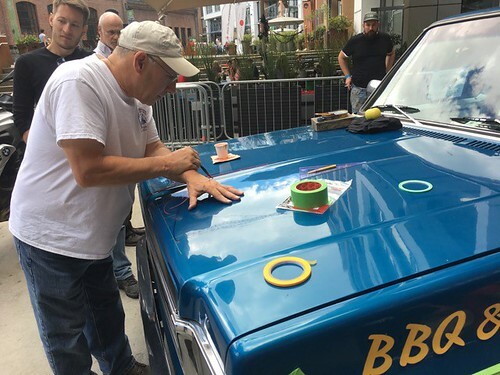 The legendary Bob Behounek adds pinstripes to the truck project. Top: Gustavo Ferrari showing off his Fileatado Porteño skills – the Argentine signwriter is a leading authority on this vernacular style. Dave Kynaston’s superb directionally burnished gold leaf shadows. 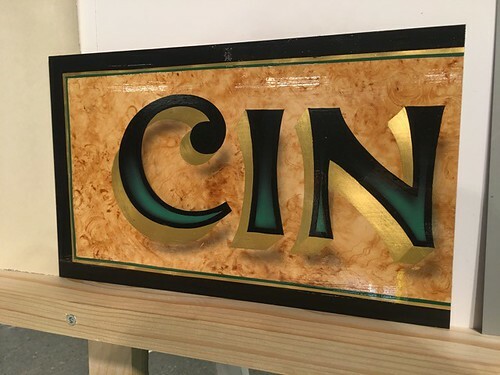 You could partake in decorative Victorian glass sign work from UK’s Dave Smith and Aussie, Will Lynes and Chicago’s Bob Behounek, of Sign Craft magazine who shared layout wisdom from his 40+ years in the business. One of the most innovative pinstripers, Pekka ‘Wizzz’ Mannermaa from Finland offered expertise on Hot-Rod painting. Dave Kynaston, the Roman Letter aficionado, gave an expert class on scrollwork. 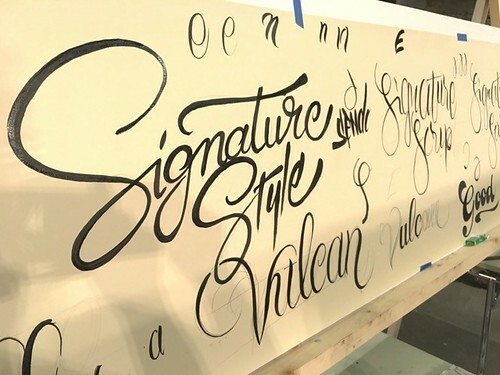 Master calligrapher Paul Antonio took up the brush and led an intense session on copperplate lettering. Mike Meyer gave a class on speed lettering. And Cheryl Maclean gave her expert advice on chalkboard work. You could develop your own individual script style with Peter Anthony, practice traditional Argentinian Fileteado Porteña with Gustavo Ferrari (see ‘Fileteado Porteño – past and present’ on the Eye blog) or make a distressed and aged panel with Rick Jantzen. Also on offer were wood graining and the opportunity to join in on collective mural and truck painting. Highly distinctive pinstriping from Finland’s award winning Pekka ‘Wizzz’ Mannermaa. One of the practice boards from the busy Script Lettering class. 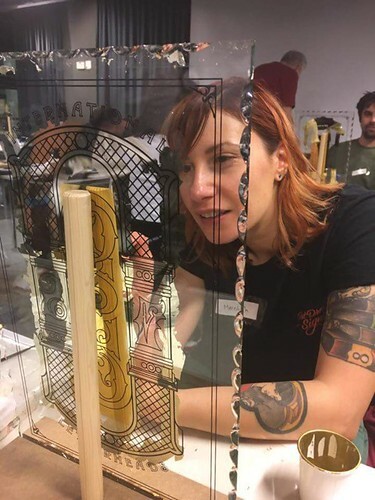 Meredith Kasabian of the Pre-Vinylite Society gets down to some reverse glass gilding in Dave Smith & Will Lynes’ class. Sunday morning included a session on workshop health and safety (too much like the day job! ); expert talks on eighteenth-century British Inn signs from Meredith Kasabian of the Pre-Vinylite Society; and the origins of the alphabet from the inimitable Paul Antonio. There was a premiere of the short film When Better Letters Met Cliff Headford (directed by Sam Roberts), a magical interview with an old Bristol signwriter who was well into his nineties when filmed last year. Cliff, sadly no longer with us, was such a wonderful man – most of the audience had something in their eye after seeing this! Next on the bill was Adrian Harrison’ short Everyone Back To Joby’s, some fun footage of The Abnormal Letterheads Meet at Carter’s Steam Fair Yard last year. A frisson of excitement ran through the audience when Mike Meyer announced the ‘breaking news’, that the 2018 Meet will take place in London. Joby Carter’s next Bizarre Letterheads Meet takes place 18-19 November 2017. The 2018 International Letterheads Meet takes place in London, dates and venue TBA, contact Better Letters for more info. When Better Letters met Cliff Headford, 2017, directed by Sam Roberts, Better Letters. Filmed and edited by Dan Bassett with animation by Lawrence Dodgson and additional photography by Luke Welch. Everyone Back to Joby’s, 2017, directed by Adrian Harrison.